You are currently browsing the tag archive for the ‘bulldog’ tag. In ‘The Legend of Rockabye Point’ a polar bear tries to steal blue finned tuna from a ship which is guarded by a vicious bulldog. However, he’s hindered by Chilly Willy, who does anything to awaken the bulldog. The polar bear repeatedly tries to save his skin by singing the bulldog back to sleep. In the end, it has become a habit, and we watch the old-aged polar bear singing his old friend to sleep in his arms. Penned by Michael Maltese, this cartoon shares some ideas with ‘Deputy Droopy’ (which was made earlier, but only released six months later), but the result is fresh and original. 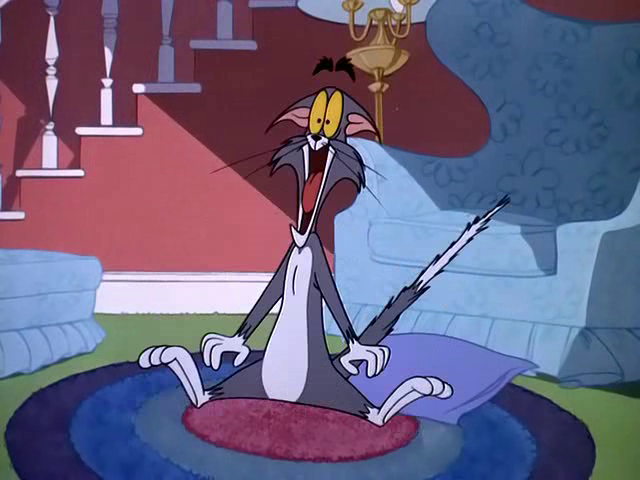 ‘The Legend of Rockabye Point’ was the third of four cartoons Tex Avery made at Walter Lantz’s studio, and without doubt it is the best of the lot. Avery’s timing is, as always, excellent, and the gags come fast and funny. 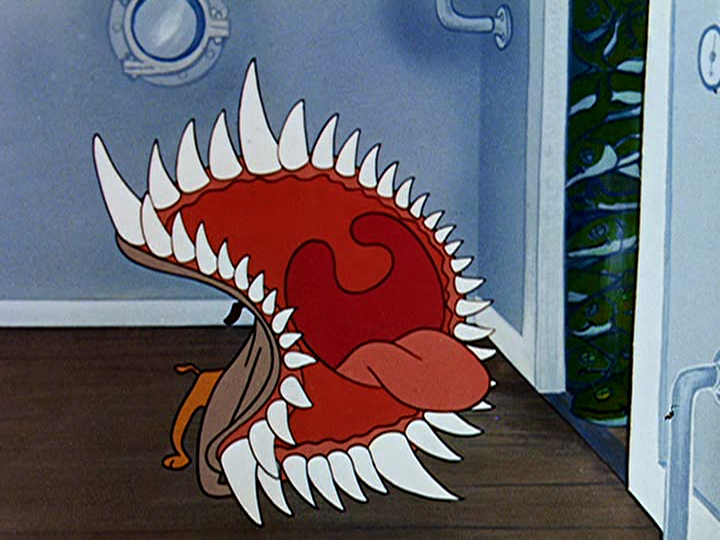 In fact, the cartoon is one of Tex Avery’s all time best, and it stands as Avery’s last masterpiece. 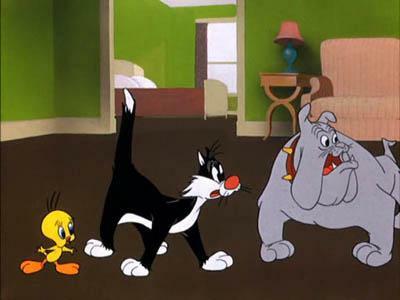 Among all the masterpieces of animation, this must be the most inconspicuous one: it’s a seemingly classical dog and cat story, involving quite some dull dialogue (provided by the dog’s mistress, of whom we only see her legs), and its looks are quite traditional, with unremarkable layouts and backgrounds. 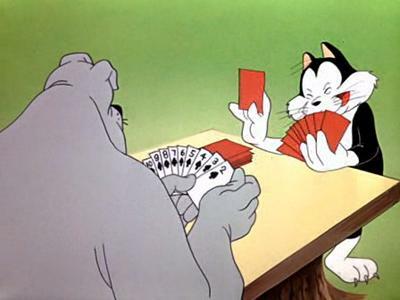 Nevertheless, ‘Feed The Kitty’ is a real masterpiece, and its reputation is entirely due to the acting of its main character, the gentle bulldog Marc Anthony. 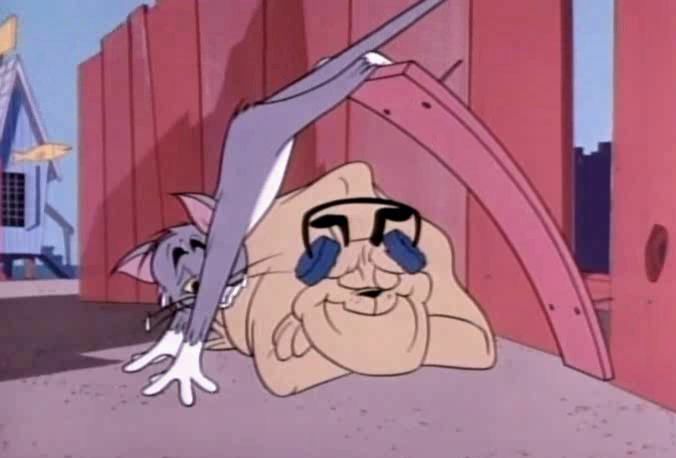 His facial expressions are so wide ranging, so extreme and so heartfelt that ‘Feed the Kitty’ can almost be regarded as a study in depiction of emotion. 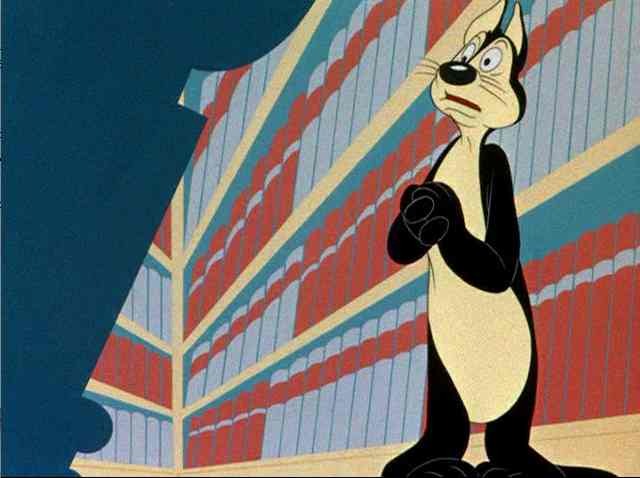 Silent acting really reaches its peak here, and director Chuck Jones is without doubt at his all time best in this sweet little cartoon. In ‘Feed the Kitty’ Marc Anthony adopts a sweet little kitten, but he’s not allowed to bring anything into the house. This leads to various gags with the dog trying to hide the little kitten from his mistress. 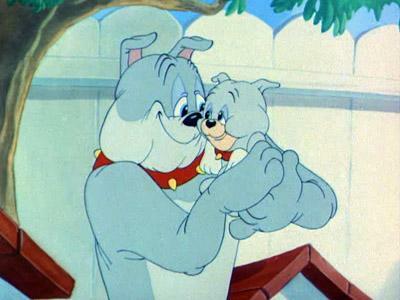 However, the highlight of the cartoon is the sequence in which Marc Anthony thinks his darling pet is dead. His emotions are both hilarious and heartbreaking. Never before has the anxiety of having lost a dearly beloved been so convincingly put to the animated screen. At this point I often can’t keep my tears from running. 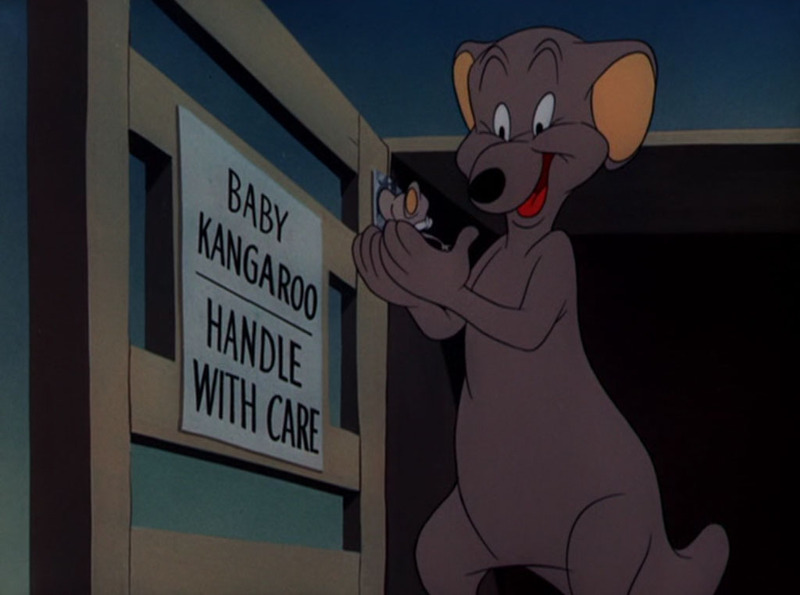 Indeed, this sequence is so popular among animators that it was almost exactly copied in ‘Monsters, Inc.‘ (2001) as a homage to the original. 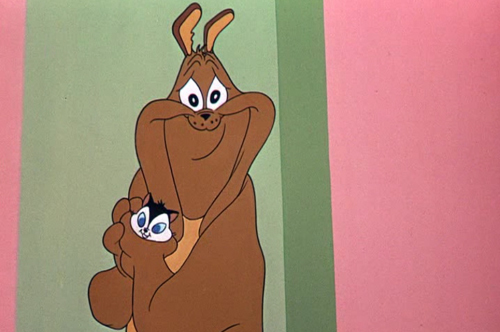 I’d say, if cartoons were shown at funerals (and why not? ), ‘Feed the Kitty’ would be a perfect candidate.